I penned my thoughts to write on America’s Biggest Leaders, but somehow found my way to the mailbox. There I saw Fortune’s list of “The World’s 50 Greatest Leaders”. 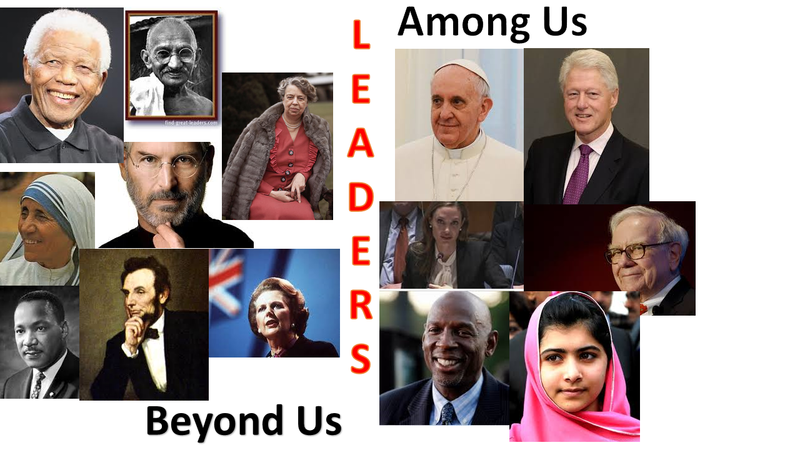 It was no surprise that Geoff Colvin identified the world’s most extraordinary leaders with his criteria being among the living and currently active in their leadership roles. These great individuals included the likes of Pope Francis, Bill Clinton, Warren Buffet, Geoffrey Canada, Angelina Jolie, and others. I shifted my attention to deceased leaders instead. These individuals were unlike the mega entrepreneurs discussed in Buchholz’s New Ideas From Dead CEOs. Since Leadership means different things to different people, I decided to use Bill Clinton’s definition. In his words, leadership is bringing people together in pursuit of a common cause, developing a plan to achieve it, and staying with it until the goal is achieved. He believes that leaders share the attributes of steadfastness in pursuit of a goal, flexibility in determining how best to achieve it; the courage to make hard decisions; and the confidence to stay with it and explain it. As the world yearns for effective leadership, it seems to defy us, and as Colvin asserts, it is becoming even more difficult to identify. Of the various leadership attributes, humility was a trait identified by Jim Collins in his research on Good to Great leaders. This quality seems to evade leaders in our society today, in their quest to achieve Success. Humility enamors not being arrogant, haughty or conceited. But more the qualities of being unpretentious and unassuming; modest, courteous, respectful, teachable and selfless. Top humble leaders that have passed on that emerging leaders can learn from include Nelson Mandela, Abraham Lincoln, Martin Luther King Jr., Mahatma Gandhi, Mother Teresa, Eleanor Roosevelt, among others. As the ambitious individuals among us strive to be great, humility is encouraged. Let’s be mindful that once “we think we have got it, we have lost it”. What are your thoughts? Which other past humble leader can you add?